Thinking of leaving on a jet plane but worried your budget is more Bognor than Barbados? 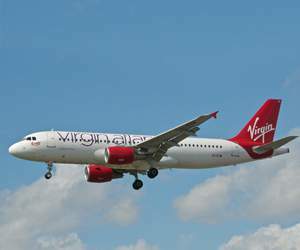 With a Virgin Atlantic discount code you can enjoy great deals on a wide selection of flights connecting destinations worldwide. Whether you want to lounge on a beach with a cocktail in your hand or tear up the town on a trendy city break, a Virgin Atlantic promo code can help you book your adventures for less. Founded as British Atlantic Airways in 1984 by American lawyer Randolph Fields and pilot Alan Hellery, the airline was initially imagined as a commercial service connecting Britain with the Falkland Islands shortly after the end of the Falklands War. When Fields met Richard Branson at a party, the airline venture became Virgin Atlantic – now the UK's second largest long-haul airline, carrying over 5.4 million passengers to over 35 destinations worldwide every year. Virgin Atlantic has always been an innovative company going against the grain, from its founder's unlikely move from the music industry to quality, value-for-money airlines to their series of firsts: the first airline to offer individual TVs to their business passengers, the first airline to launch a super economy service, the first commercial airline to power a plane using biofuel – the list goes on. Virgin Atlantic is dedicated to providing a high quality service for passengers at every level from economy to business class. Their economy cabins offer fantastic value for money with excellent service, great food and fantastic in-flight entertainment, while their Upper Class service provides the ultimate in luxury with chauffeur transfers, seats that transform into the longest flat beds in any business class, gourmet cuisine and much more. Virgin Atlantic flights serve some of the most popular destinations around the world, with everywhere from beach locations such as Mexico and the Caribbean to international capital cities served by the airline's fleet of Airbus and Boeing jets. With its main bases at Heathrow and Gatwick, the airline covers North America, Canada, Africa, the Middle East and East Asia, with new destinations being added all the time. The airline also runs 'Little Red Flights', offering great value flights to the UK from destinations worldwide. Want to get adventuring with Virgin Atlantic? 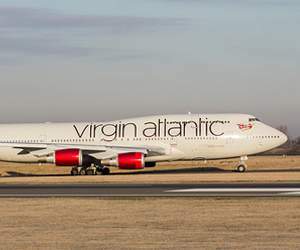 With a Virgin Atlantic discount code you can get great deals on flights anywhere in the world. Whether you want to enjoy a relaxed beach holiday with family and friends or you need to book an Upper Class flight for important business on the other side of the pond, Virgin Atlantic offers can help you save money when you book. 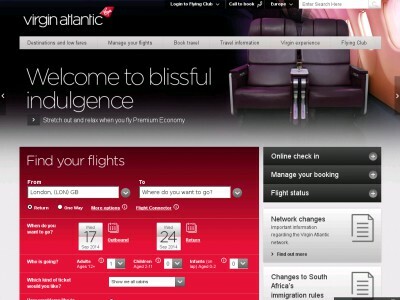 Browse our website until you find a Virgin Atlantic discount code that suits you, then navigate to their website to browse flights. Enter your desired destination and other flight details, then click 'Book your flight'. Choose your flights and click 'Next step'. Enter your Virgin Atlantic promo code where applicable. Want to find out more about what's out there waiting to be discovered with Virgin Atlantic? Why not pay a visit to their dedicated YouTube channel? You'll enjoy lots of fantastic content including travel inspiration, behind the scenes documentaries, cabin previews that let you know what to expect on board and much more. You can also use this channel to find out more about saving money with a Virgin Atlantic discount code. If you've enjoyed shopping for flights with Virgin Atlantic, you might also like browsing hotels with Expedia or Booking.com. Or if those aren't up your street, you'll find plenty more to discover in our Travel section. In category Travel there are lots of online stores such as British Airways. We especially recommend coupons and voucher codes to online stores such as Opodo, Ryanair . Navigate to their website to browse flights. Enter your personal and payment details to book your flight. Be sure to enter in your free Virgin Atlantic discount code before pulling finalizing your payment! Need to contact the team at Virgin Atlantic? Whether you have a question about your booking, want to know more about the different classes of cabin or simply want to find out more about saving money with Virgin Atlantic offers, you can find the number for the appropriate Customer Services department at the contact link here. Want to discover more about what's happening behind the scenes at Virgin Atlantic? Why not follow the company across all your favourite social media platforms. You'll find lots to explore including competitions, travel inspiration, in-flight footage and more. You can also use these pages to find out more about saving money with Virgin Atlantic voucher codes. Don’t forget to check them regularly, as you can never be sure when a free Virgin Atlantic code might be waiting for you! Buy now online at www.virgin-atlantic.com. Having a big family often means that exotic holidays can seem like a pipe dream – which is why I was delighted to discover the great savings I could make with a Virgin Atlantic discount code. Virgin Atlantic offers a wide range of short-haul and international flights to some of the world's top holiday destinations – and with a Virgin Atlantic promo code all you need to do is log on to virgin-atlantic.com to enjoy some fantastic deals. So if you want to get away on holiday this year, why not check out the latest Virgin Atlantic vouchers?